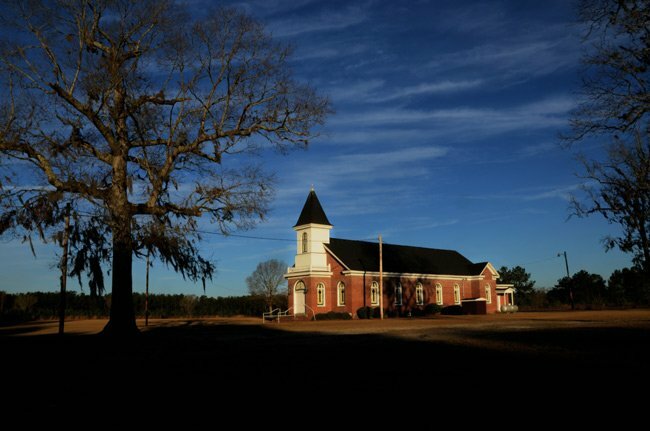 This brick church tucked in the farmlands of Manning is the fourth location to serve this congregation since its inception in the late nineteenth century. The church formed sometime in the late 1800s as rural Spring Grove Church. Soon after its formation construction of a new road began, and the congregation relocated to a stand of pines on the Old Santee River in neighboring Greeleyville. The congregation built a church and called it Pine Grove for its sylvan locale. The congregation quickly grew, and by 1918 a larger church building was needed. On September 29, 1919, the cornerstone of the second Pine Grove AME Church was laid. As families grew and more people moved to the area, the church body continued to expand. Wear-and-tear from the increasing membership also took its toll on the sanctuary, and construction on the present building commenced in 1957, commemorated with a cornerstone. A second cornerstone, embedded in 1963, marks the completion of the church. Since that year an education building has been added, and in 1994 the church was refurbished. Pine Grove AME Church continues to thrive with an active congregation. My dad grew up in Greeleyville, SC and his family attended Pine Grove Baptist Church. I was just wondering if there is a cemetery next to the church? That’s where my grandparents are buried Ella Ned, Emanuel Ned and my aunt Ellen Ned Murray.